There are many good homeopathic programs today. RADAR, RADAROpus, MacRepertory, ISIS, Mercurius, and Complete Dynamics are among the popular ones (I have with me all but the last one). Among web-based programs, Vithoulkas Compass is one that I subscribe to. Most of these include a patient database feature in order to keep track of the progress of a case. My experience with these programs has been very positive. They are all great programs and help a busy homeopathic physician repertorise a chronic case fairly quickly. Of course, it is important to keep in mind that just because you have a good homeopathic software does not mean you will be automatically able to get the “correct” remedy after the first repertorisation. The software is a mere tool in the hands of a skilled craftsman. And more importantly, all repertories continue to evolve, so no repertory is perfect at a given point in time. Several years ago, I started working on a homeopathic software (internally named iCure) with the idea of providing additional features that I thought would be useful to the physician. 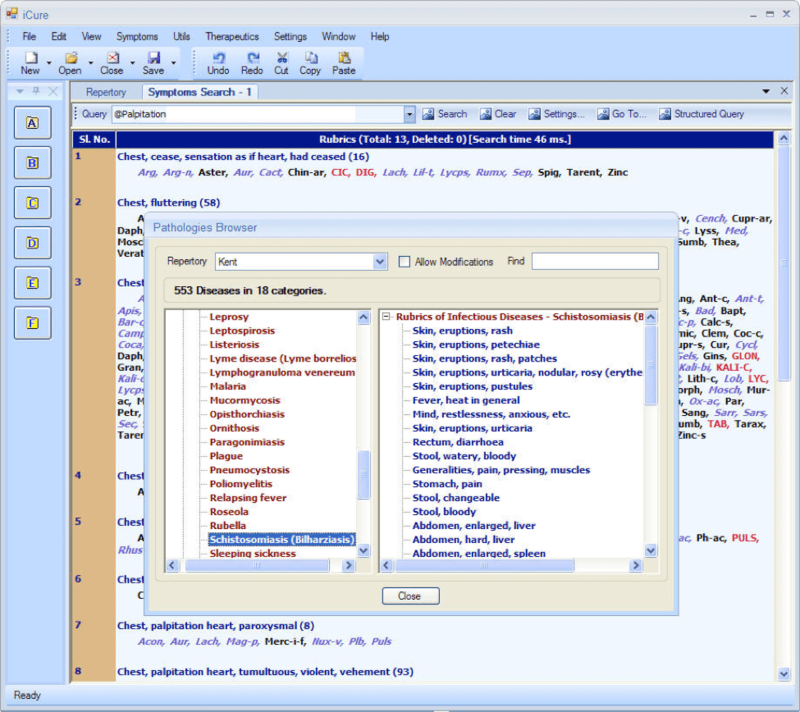 Some of the features I had in mind were repertorizing from natural language text, natural representation of rubrics (as opposed to the stylized form in use today), disease diagnosis, themes, and so on. I worked on the software for a while and then put it on hold because of other commitments. I hope I will be able to take this up again in the near future. In this post and a few others to follow, I plan to briefly describe these features. Who knows, some of my readers might develop a highly intelligent homeopathic program one day! When we interact with a patient and identify signs and symptoms pertaining to his chief complaint, it is important for us to know if there is any underlying pathology. This is required for several reasons. First, it will help us to decide if additional laboratory or other tests must be advised. Secondly, if we know the disease, then we know what are the common symptoms of the disease and this way, we can exclude them from repertorization. Remember, we should consider only rare and peculiar symptoms when we look for a remedy. iCure has, in its database, a mapping between various diseases and their symptoms as found in the repertory. This is a painstaking effort and I remember taking the help of my allopath friends to compile this information. Take a look at the screen image below. You can see that the disease Schistosomiasis includes many rubrics from Kent repertory. The same rubric might appear in multiple diseases. For example, Stomach, pain is a common symptom of many ailments. 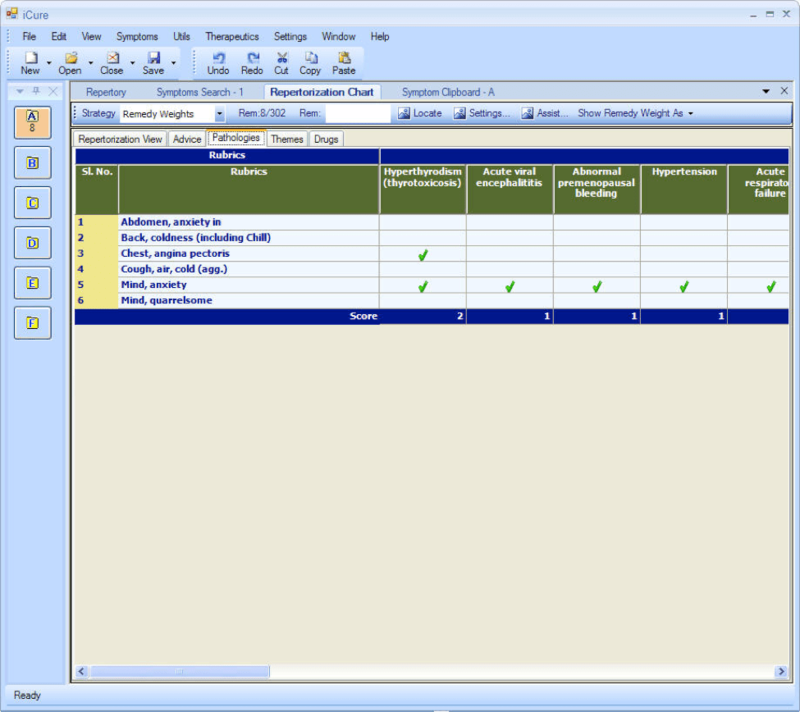 When you repertorise a case with a set of rubrics, iCure will show you the diseases in which these rubrics are present. In addition to the regular flat repertorisation showing remedies, you can also choose to see the table of diseases. See the following figure. I believe this information will be quite useful to a homeopath.